Sonifex Sales Manager, Richard Butlin, (2nd Left) and Managing Director, Marcus Brooke, (3rd Left), receiving the BaM Award™. 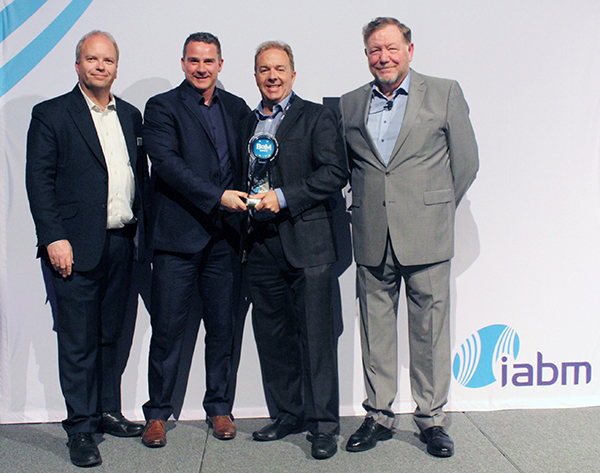 The winners of IABM’s new Broadcast and Media awards were announced at IABM’s BaM Awards™ party on 10th April at the NAB Show 2018 in Las Vegas, USA. The new Sonifex AVN-PXH12 Rackmount AES67 Stream Mix Monitor won the BaM Award™ in the "Support" category. The judges commented: "The product lives up to its reputation. It is not complex but extremely functional which the "user" environment really appreciates." Marcus Brooke, Managing Director of Sonifex said: "It’s a great honour for one of our new products to be recognised as being outstanding in this industry. The rise of IP audio and video throughout broadcast is changing the way that broadcasters operate and with the change, new opportunities are arising to develop products in different ways, to offer access to the myriad of audio and video channels available. The mix monitor is a triumph of a simple user interface making the job of monitoring much easier and is just one of many AES67 compatible products that we're working on." The AVN-PXH12 Rackmount AES67 Stream Mix Monitor is a world first. It can simply and effectively simultaneously monitor and mix up to 24 AES67 AoIP sources in a compact 1U rack to a speaker/headphone combination in a quick and intuitive way so it is ideal for use in production galleries, OB trucks and engineering racks rooms. The product was also winner of the AMI "Best of Show Award" for IBC2017.